Starting with the invasion of Tarawa in November 1943, most Marines who assaulted enemy-held beaches in the Pacific theater came ashore in tracked amphibious vehicles known as the LVT (Landing Vehicle, Tracked) or "Alligator." 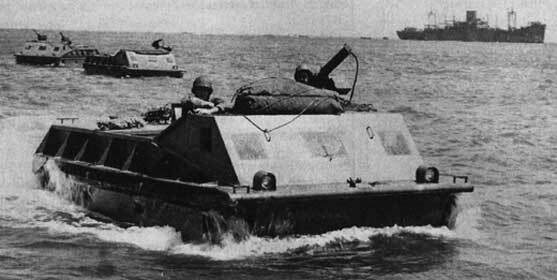 Where conventional landing craft would become hung up on coral reefs, the assault tractors would climb over them and then cross the lagoon to deposit their passengers on the beach. 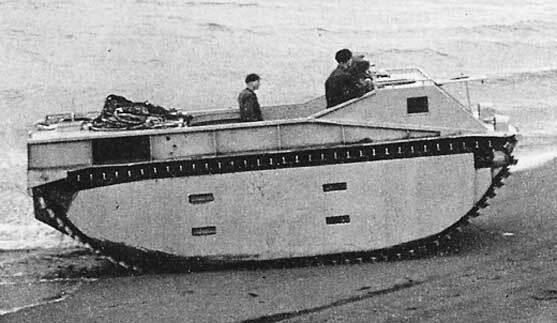 Amphibious assaults became far more effective, and the numbers of casualties suffered was probably far less than would have been incurred using traditional landing craft. The vehicle grew out of financier John A. Roebling's distress over the great loss of life suffered by residents of southern Florida during hurricanes that struck in 1926, 1928 and 1932; the 1928 hurricane killed over 2,500 people, most of them poor black farm workers who had no means to escape the raging storm surge. Roebling, whose father designed the Brooklyn Bridge, turned to his engineer son Donald with a challenge to build a vehicle that could go to places where a car or truck would stall and a boat would run aground. Donald Roebling unveiled his prototype in 1935. Built from aluminum, then almost unheard-of for such purposes, the Alligator as he called it used its tracks to both paddle it through water and drive it on land. This first model had bogie wheels and return rollers, much like a tank tread; the next prototype instead ran the tracks through steel channels. In October 1937, Life magazine ran a picture and description of Roebling's invention, attracting the attention of several officers of the U.S. Marine Corps. Marine officers went to Florida and test-drove the Alligator, but the Marines had no money to buy even one of them. Marine Brig. Gen. Emile P. Moses, head of the Corps' Equipment Board, went to see Roebling at his design studio in Clearwater and somehow talked him into building an $18,000 test vehicle on his own account. Another prototype, this time built of welded steel, was built in the summer of 1940 with Navy funds and this was accepted for series production. Alligators of several models assault Okinawa, 1945. Food Machinery Corporation, a Philadelphia-based maker of insecticide spray pumps, had supplied a number of components for the "free" Alligator, and the Marines rewarded them with the first production contract, for 100 Alligators. The first went to the Marines in July 1941, and over 1,200 of this LVT-1 would be manufactured. It had no armor, and could do about 12 miles per hour on land and six knots at sea. It was armed with two machine guns, and could carry 24 troops or a small gun or vehicle. Continual improvements added armor and a large ramp at the rear of the vehicle, and improved speed over both land and water. By 1944, fire-support versions with turrets taken from M3 Stuart light tanks and M8 Scott assault guns appeared. All vehicles used in World War II were open to the sky; a new version with an armored roof entered service in 1949. LVTs hit the beaches of Guadalcanal. At Guadalcanal, the Alligators were mostly used to bring supplies and equipment ashore; the assault troops hit the beaches in "Higgins boats," as the Marines called the early LCVP landing craft. At Tarawa, however, the LVT carried troops over the coral reefs and saved countless lives. Huge waves of LVTs carried the assault troops to the beaches at Leyte, Saipan, Tinian and Okinawa. In the Marianas, gun-armed LVTs even moved inland to act as awkward tanks in support of the Marines. Smaller numbers saw action in Europe; Canadian troops employed the "Water Buffalo" in the Dutch estuaries in 1944. All told, over 18,000 were manufactured, with most of them going to the Marine Corps. The LVT appears in Saipan 1944 in its more advanced models (including those armed with guns). Mike Bennighof is president of Avalanche Press and holds a doctorate in history from Emory University. A Fulbright Scholar and award-winning journalist, he has published over 100 books, games and articles on historical subjects. He lives in Birmingham, Alabama with his wife, three children and his dog, Leopold. Leopold fears alligators.